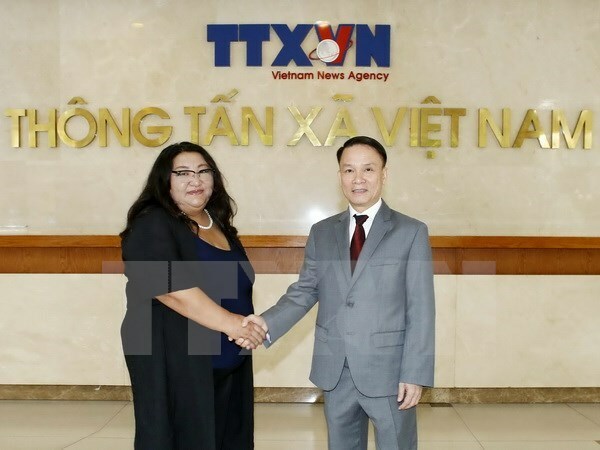 Hanoi​ (VNA) – The Vietnam News Agency (VNA) and the Montsame News Agency of Mongolia signed a new cooperation agreement on August 15 to tighten their profession links in the digital era. Accordingly, the two agencies will maintain the exchange of text news and photos with captions in English and increase the sharing of news videos, especially documentaries on the land and people of Vietnam and Mongolia and investment and business opportunities in each nation. They pledged to maintain annual exchanges of reporters and continue to support each other at regional and international press forums participated by both sides, particularly within the framework of the Organisation of Asia-Pacific News Agencies (OANA). Speaking at the talks in Hanoi, VNA General Director Nguyen Duc Loi noted the agencies’ implementation of the 2001 protocol on specialised cooperation, which, as he said, has yet tapped bilateral cooperation potential, urging the two sides to strengthen their ties in the time ahead. Regarding APEC Vietnam 2017, he said the VNA is ready to provide information about this event for Montsame, and it hopes that the Mongolian news agency will step up the promotion of this event on its communication channels. Congratulating the VNA on its recent achievements, Montsame General Director Ganchimeg Badamdorj also expressed her wish to reinforce cooperation between the two sides. Both general directors shared the view that the VNA and Montsame need to boost exchanging information about their countries’ economy, trade, investment and tourism so that Vietnamese and Mongolian businessmen and people will have better mutual understanding and expand economic partnerships. The VNA boasts a network of 63 bureaus in all the cities and provinces nationwide and 30 overseas bureaus across the five continents. With more than 60 media products by more than 1,000 reporters and editors out of its 2,400-strong staff, the VNA is now the media office having the largest number of products and forms in the country: bulletins, photos, television programmes, dailies, weeklies, monthlies, magazines, pictorials, books, TV channel, e-newspapers and information programmes on mobile platforms.